Among the many reflective contributions to this new volume from the enterprising Centre for Cross-Cultural Research on Women at Oxford University’s Queen Elizabeth House are several derived from the colonial experience. These include Deborah Kirkwood’s excellent study of ‘The Suitable Wife’ and of ‘Settler Wives’, Beverly Gartrell’s ‘Colonial Wives’, and Janice Browfoot’s analysis of Malayan memsahibdom. In what Deborah Kirkwood categorises in her chapter on the ‘training’ of the ideal wife for overseas service (i.e. her husband’s career) as ‘good’, ‘suitable’ or ‘superwife’ - and was not the girls’ finishing school to some extent the equivalent rite de passage of the boys’ public school in the eduation of an imperial class, bred if not born to lead? -, it is the ‘premiss of dedication’ (“I must not let him down in his public position”) which looms large as the unwritten code of those known in at least one post-colonial situation as “Queens of the Canapes”. 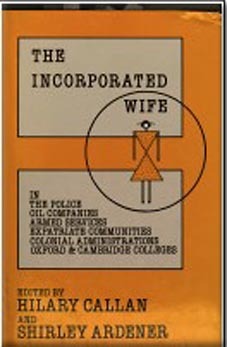 The book discusses other special situations of what one might call the nonworking wife at work (this is perhaps a handy layman’s reading of the sociologists’ concept of ‘incorporation’, ‘the nature of institutional boundaries . . . . and the structural dilemma that arises when, because of marriage, women have to be given a location in, on, or outside the boundary of an organization or institution’). These feature diplomats’ wives, British Council wives, army and police wives, dons’ wives, and ‘multinational’ (if we allow the ‘colonial’ and ‘academic’ labels) wives of, for example, Shell. All are examples of that scenario whereby a recognized social role and responsibility are ascribed to a wife and constitute an integral element in her husband’s occupational culture, identity and perceived ‘success/failure’. It is rare to be able unhesitatingly to assert with regard to a basically academic publication that here is a book which is as compelling and attractive to read as it is important and stimulating to think about. No quondum ‘colonial’ wife should fail to read it.